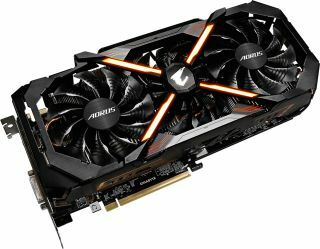 Gigabyte announced in November that it was planning to expand its Aorus gaming brand beyond peripherals and into motherboards and graphics cards. The company then followed through by unveiling a line of Aorus motherboards for Kaby Lake at CES, and now it has unveiled its first graphics card under the Aorus banner. Nvidia's reference specs call for a base clockspeed of 1,607MHz and a boost clock of 1,733MHz. Even in Gaming mode, the Aorus card sports a base clock that's faster than Nvidia's reference boost clock. Gigabyte keeps temperatures in check using its Windforce Stack 3x cooling solution, which consists of three 100mm fans and copper cooling modules. Like most custom coolers, the advertised benefits include cooler temps and quieter operation. It looks like Gigabyte is reserving its best performing parts for its Aorus brand. That certainly seems to be the case here—this card is built with premium chokes and capacitors, and uses GPUs that make it through its "Gauntlet Sorting" process. As is the trend these days, customizable RGB lighting comes along for the ride. Gigabyte says the card is backed by a 4-year warranty (online registration required). Pricing is not yet known, nor has Gigabyte announced a release date.